Summaries of articles published in ANF Apr/May, INDIA SPECIAL EDITION 2018. Click on each headlines to read. 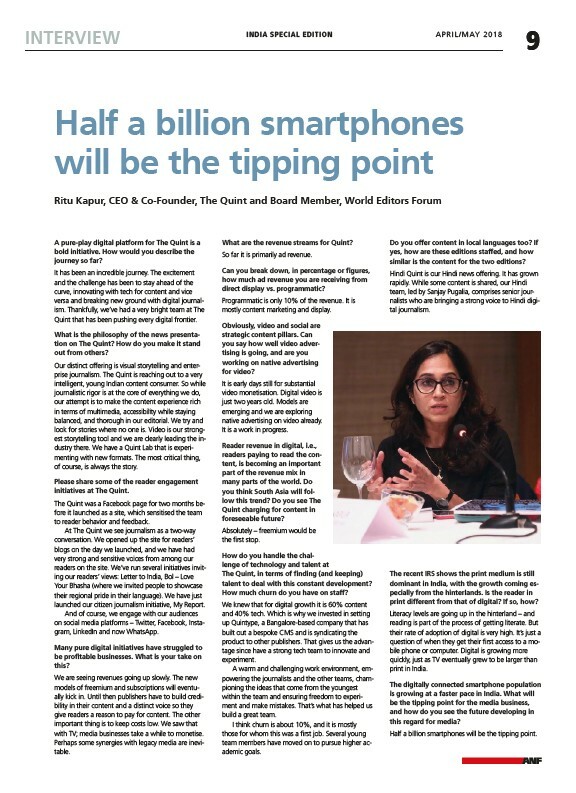 Interview with Ritu Kapur, CEO & CO-Founder, The Quint and Board Member, World Editors Forum. WAN-IFRA: A pure-play digital platform for The Quint is a bold initiative. How would you describe the journey so far. Ritu Kapur: It has been incredible journey. The excitement and the challenge has been to stay ahead of the curve, innovating with tech for content and viceversa and breaking new groundwith digital journalism. Thankfully, we've had a very bright team at The Quint that has been pushing every digital frontier. Publishers and printers across the globe are striving to upgrade their products and expand their market radius with the help of improved newsprint or even higher quality paper. 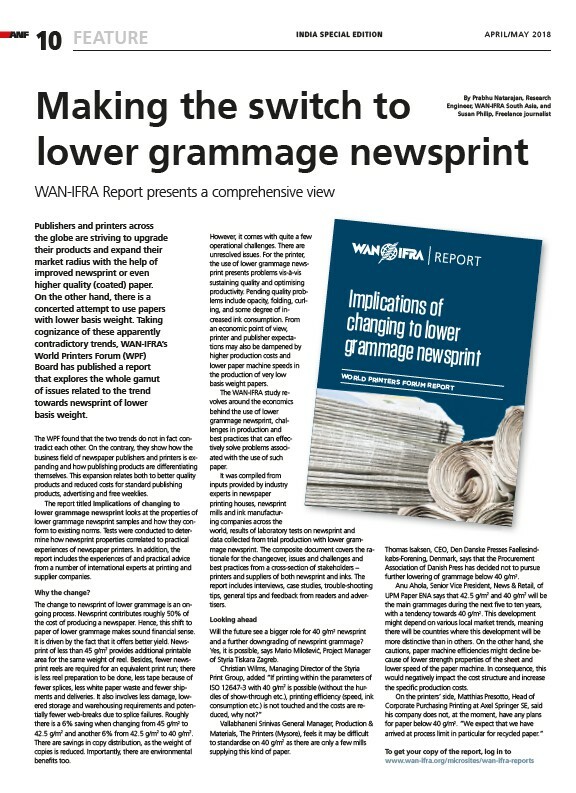 Will the future see a bigger rold for 40g/m2 newsprint and a further downgrading of newsprint grammage? Read the report. Why and How journalists can save journalism? 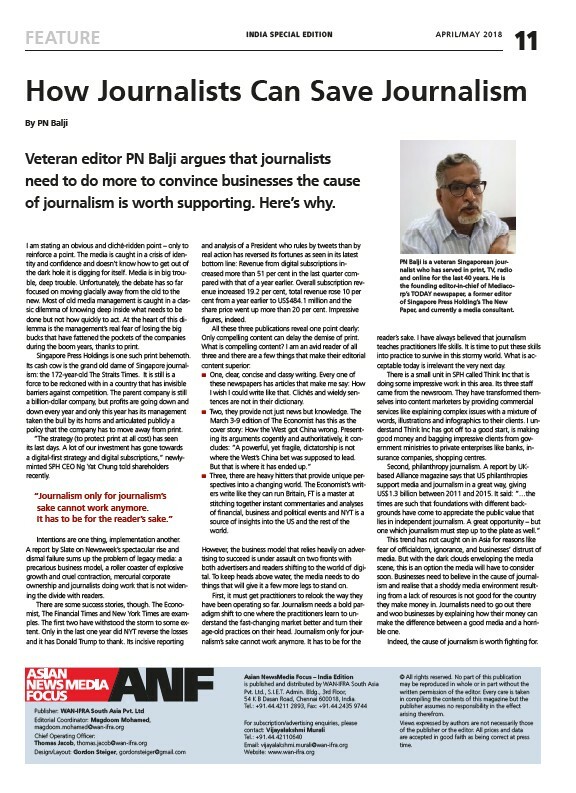 PN Balaji veteran Singaporeon journalist and founding editor-in-chief of Mediacorp's Today newspaper, former editor of Singapore Press Holdings argues that journalists need to do more to convince businesses the cause of journalism is worth supporting. The media is caught in a crisis of identity and confidence and does not know how to get out of the dark hole it is digging for itself. Yes, Media is in a big trouble, deep trouble. "Journalism only for journalism's sake cannot work anymore. It has to be for the reader's sake." 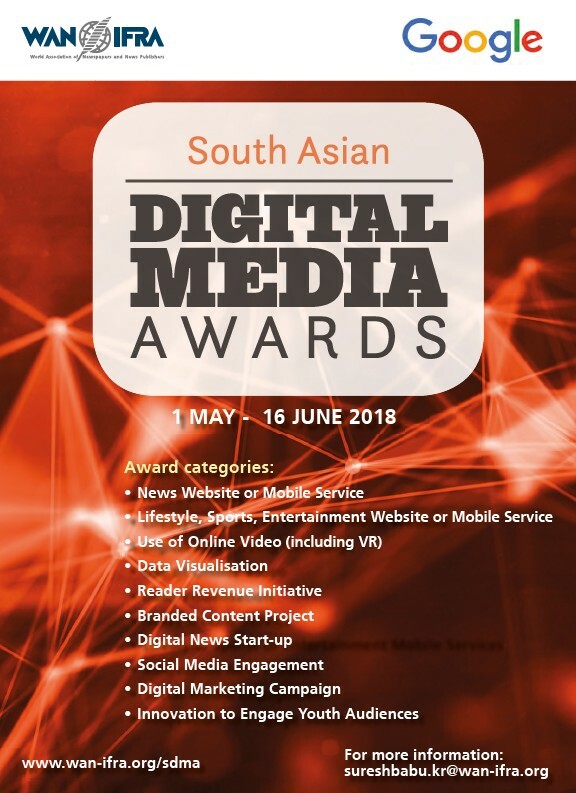 South Asian Digital Media Awards 2018 announcement and categories. 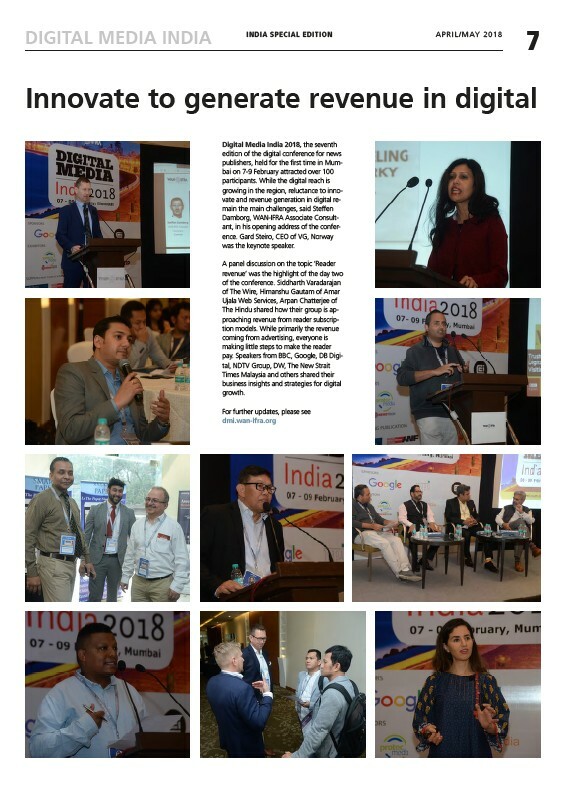 The seventh edition of the digital conference for news publishers, held for the first time in Mumbai on 7-9 February attracted over 100 participants. While the digital reach is growing in the region, reluctance to innovate and revenue generation in digital remain the main challenges, said Steffen Damborg, WAN-IFRA Associate consultant in his opening address of the conference. Upload of speakers audio podcasts will be available soon.